Phuong Huynh recently opened her online shop called Psyche's Beau. In it, she carries several brands such as A-England, Bow, DRK, Germanikure, Lilypad, Polished for Days, and Starlight & Sparkles. 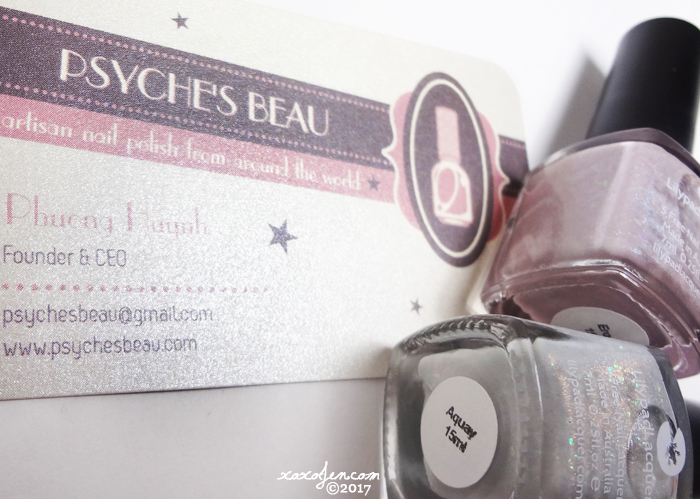 Psyche's Beau's very first exclusive shades were created by Lilypad Lacquer. They're both neutral shades with a sparkly feminine touch. The formula of each was crelly-like and I wore three coats with topcoat for photos. Vintage mauve with aqua flash shimmer plus iridescent flakes. Faded aqua grey with pink flash shimmer plus iridescent flakes. The shimmer in this was difficult to capture under bright lights, but is definitely there. It looked almost coppery to me while wearing it. 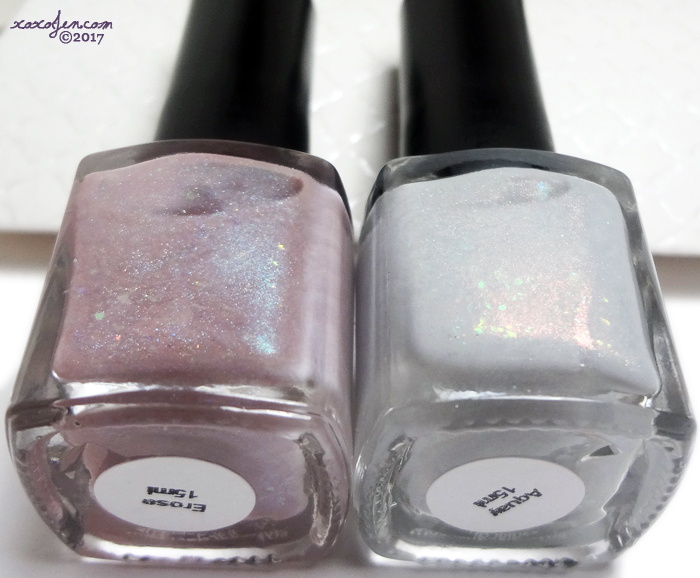 I've included a bottle shot in softer lighting below that shows the shimmer much better. 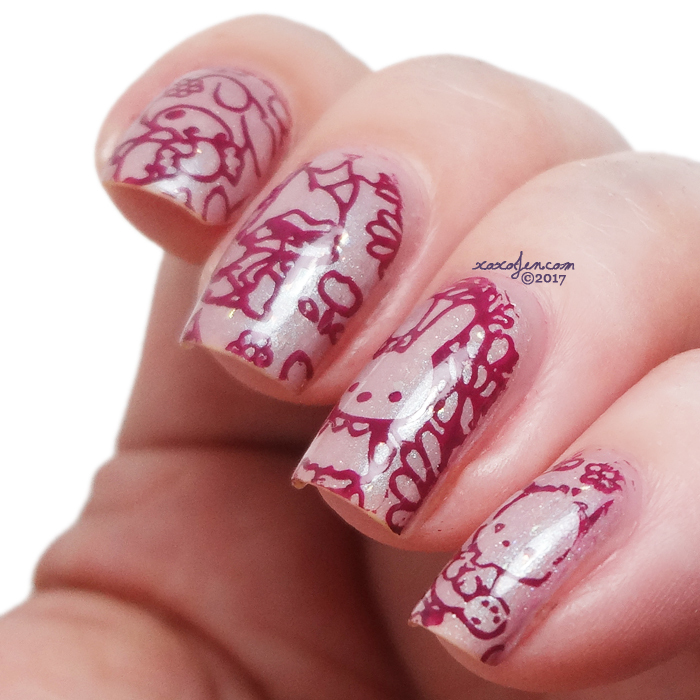 I also did a bit of nail art using MDU 63 stamping polish and Infinity plate 108. I love how it turned out! My experience with Psyche's Beau was first as a customer. I placed an order for a couple of DRK polishes and the Germanikure mani stick (that thing is amaze!!) and she approached me with a request to review. With a kind demeanor and quick shipping, she's been a pleasure both to buy from and to review for. If you haven't visited yet, please click the link to her shop and have a look around. Her website is fun to browse, even if you aren't quite ready to purchase. Don't wait too long though, grab the exclusives before they sell out! With how pretty these are, I think they will be gone quickly. Both colors look nice and delicate. 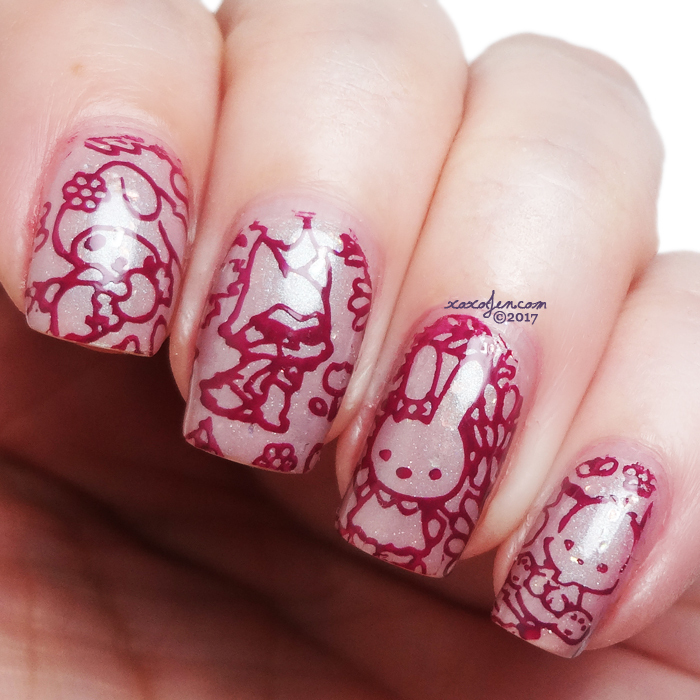 Cute nail art stamping too.